This dish came together by complete freak accident. Seth’s mother was visiting, and we had bought and marinated a bunch of shrimp for grilling. Unfortunately, when it came time to grill, the weather looked mean and scary, so we turned to the stove and quickly improvised a shrimp scampi pasta from what we had on hand. Well, short story, it was amazing, the best shrimp scampi we’d ever had, and we’ve been struggling to recreate it ever since. After weeks of testing, failed attempts, and altering, we finally got it back! Something about this dish makes me picture a rustic, beachside, seafood bistro in New England. You get a bowl brimming with pasta and shrimp, filled with the spicy, garlicky, lemony flavors. You pour two glasses of wine, maybe light some candles, you go to your table, and you talk with your significant other. Or you first stuff your face with dinner and then talk. But it is definitely a dinner that involves some romance. The shrimp marinade itself was adapted from Cook’s Illustrated (August 2011 Summer Grilling Issue). In a medium bowl, whisk lemon juice, 3 tablespoons olive oil, lemon zest, parsley, garlic, salt, and red pepper. Add the shrimp and toss with the marinade. Place in the fridge to marinate for 15 minutes. Cook the marinated shrimp on a buttered griddle over medium-high heat, be sure to brown each side (about 3-4 minutes per side). Set aside. Bring a large pot of boiling salted water to boil and cook linguine according to package directions. In a large sauté pan, melt butter, lemon zest, ¼ teaspoon salt, ¼ teaspoon black pepper, and the parsley together over medium low heat. Add minced shallot, garlic, and red pepper flakes. Sauté until shallot is soft. Add the white wine and lemon juice. Increase heat and reduce just a bit. Add the arugula. Use tongs to coat and wilt the arugula. Adjust salt and pepper to taste. Toss with the cooked shrimp. To serve, place pasta on individual plates. Drizzle olive oil and about 2 tablespoons of chopped parsley over each plate of noodles. Then spoon some shrimp and sauce over the herbed noodles. This looks and SOUNDS amazing! Love the little bit of spice! YUM! yes please!! I like how it's served too ;) wine, candles, date night at home! This looks and sounds amazing! A good shrimp marinade is hard to come by. I love the way this dish came together. great story. Don't you just love it when you stumble onto a great recipe without even trying? This looks Amazing!! Dear Jenn, I do enjoy Cook's. It always has a recipe to stimulate your cooking senses. This does look really good! Spicy and Shrimp are two of my very favorite things. This is definitely a must try!!! Ha-I my freak accidents turned out like this, I would be a very content person in the kitchen. Love the blend here and the sauce ingredients really do sound like a great base for this wonderful dish-yum! Umm I need this in my life ASAP. Amazing! Delicious! I can't wait to try this (my mouth started watering the minute I saw the photo!). I'm loving the butter - is there such a thing as "too much butter"? Thank you for sharing! Some of the best food comes by accident I've found! What a win! That looks so good! And the recipe sounds like one of the best Shrimp Scampie recipes I've see! This sounds delicious, and I'm not even a shrimp person! Yum! Freak accidents are usually the best, it's just remembering how it happened, LOL. Love your romantic seaside bistro in New England, I can see it. Lovely recipe. Sometimes freaky accidents produce the best meal! and this is just that. It look lovely Jenn! Thanks for sharing the recipe. And what a freak accident! The pasta looks spectacular! That is really how the best dishes are made -- this one looks amazing! Wow, this does look amazing. Don't you love it when you actually can recreate something that was amazing! (I am the world's worst about writing down improvisations!) Loved the visual for this dish as well---the beach bistro! What a gorgeous photo! I LOVE spicy shrimp dishes, can't wait to try this one. this dish may have been a freak accident but there is nothing freaky about it! instead, it looks very tasty! That looks incredibly good! You couldn't pack any more flavor in there if you tried! WOW, so garlicky and fabulous!!! YUM. that pasta dish looks PERFECT! The cooked shrimp look amazing, I love the sauce too and loveee the arugula in it. Shrimp and arugula go so well together! This looks amazing! Great pictures! Have a fabulous week! So the bad weather was pretty serendipitous in the long run! Sounds like such a lovely pasta. This dish looks absolutely delicious! wonderful pasta and shrimp recipe. I'm glad you got it back because this dish looks amazing. It's now on my dinner menu. Thanks for sharing. I can see myself making this pasta right now! I love the flavors that you've used, especially the arugula. It sounds so simple, yet looks so impressive. I can't wait to try this. Thanks for sharing this! Oh those blackened edges of the shrimp looks amazing. 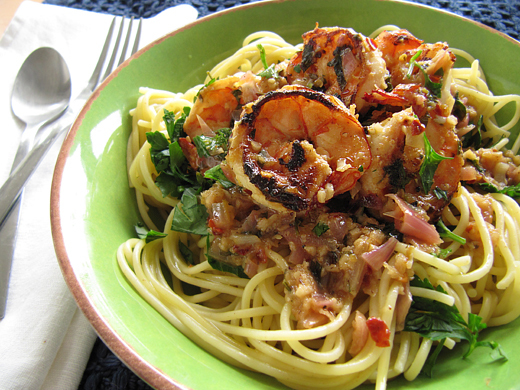 A good scampi is definitely up these in my top ten favorite dishes, so refreshing and light. David would LOVE this due to the buttery sauce. It looks spicy and flavorful. Yum!